Last weekend, while the beer curious in Roanoke once again took over a large section of downtown for the second time in a less than a month, this time to celebrate another Deschutes event by bellying up to the Oregonian brewery’s admittedly impressive, multi city block, nomadic “Street Pub”, another beer related event was occurring almost simultaneously, albeit one that was a bit more low key. 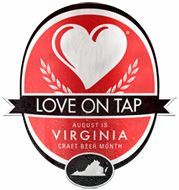 South Roanoke’s beloved purveyor of coffee, Sweet Donkey Coffee House, had just finished installing their taps – yes, beer taps – just in time for the weekend, and they celebrated this new side of their business by hosting their own Deschutes tap takeover that Friday night. For those who might be unfamiliar with Sweet Donkey’s non caffeinated offerings, bottled beer has been on the menu for a while now. So at first, offering beer on draft might seem to be simply a deeper level of commitment to that side of their business. But for regulars to the coffee shop, you likely know better, and for those perhaps who are not too familiar with Sweet Donkey, and are still wrapping their minds around the thought of a coffee shop with beer at all, it is much, much more than a new business plan, and really couldn’t make better sense. With its fenced in front yard, its wide front porch and side patio, and its wholly welcoming and comforting look given by the large brick house it calls home, Sweet Donkey might as well be the poster child of what a neighborhood coffee shop – and therefore, a central spot for friends to gather over any shared, social beverages of choice, be it a cup of coffee or a cold beer – should be. Simply put, I’m not sure there is a more charming spot to enjoy a beer other than your own porch at home. Offering draft beer then, is not just a commitment to a business model, but clearly is what the owners want the experience of their shop to be for their customers. A common school of thought these days in the overall beer community is that should a “bubble” of some sort burst in the craft beer business, that breweries dedicated to primarily serving to the folks who can easily drive across town or even walk down their street to reach the brewery will be one trend that not only survives, but flourishes. No, of course Sweet Donkey doesn’t brew their own beer. Yet part of the charm with that particular trend is not solely based in the making of the beer, but in the creation of an ultra comfortable, neighborhood centric spot to enjoy that beer with friends. So with their announcement to serve draft beer, I couldn’t help but think that should that particular trend become more common, we may look back from a day not too far off and think of how one model of such a place might look (and feel like) was – of course – envisioned by a coffee shop. Visit Sweet Donkey’s Facebook page here. ~ by thebeerroad on September 2, 2016. Love Sweet Donkey Coffee in Roanoke, Virginia! What an awesome portrayal of the duality of Sweet Donkey.